Having carved a niche for itself in the probiotic category, Yakult Danone India Pvt. Ltd., a 50:50 joint venture between Yakult Honsha and Danone has further expanded its product portfolio in India by adding a new variant:Yakult Light. 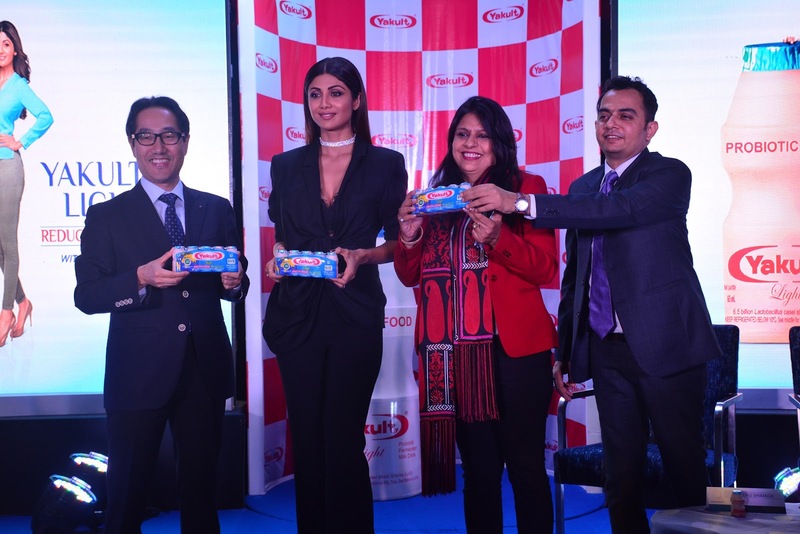 This new variant was unveiled by fitness icon and Bollywood celebrity Shilpa Shetty Kundra who endorsed Yakult Lightat a Press Conference in Mumbai today. Present on the occasion were Mr. Minoru Shimada, Managing Director, Yakult Danone India Pvt. Ltd., and Dr. Neerja Hajela, General Manager – Science and Regulatory Affairs, Yakult Danone India Pvt. Ltd.
Yakult Light is a sister product of the signature Yakult product and contains the same unique probiotic, Lactobacillus casei strain Shirota (LcS), in the same amount (6.5 billion). LcS has been scientifically proven, through more than 80 years of research, to help improve digestion and build immunity when consumed regularly. With reduced sugar and Vitamin D and E, Yakult Light caters for the daily needs of the health conscious and is suitable for all age groups. It contains less sugar and calories owing to the use of a sweetener of natural origin, Steviol Glycoside.The recommended retail price of Yakult Light is Rs. 80/- for a pack of 5 bottles. Speaking on the launch of Yakult Light, Mr. Minoru Shimada, Managing Director, Yakult Danone India Pvt. Ltd. remarked, “We are frontrunners in the probiotic category globally, and 35 million bottles of Yakult, our iconic probiotic drink, are consumed daily in 38 countries and regions across the world. Driven by our core philosophy of improving intestinal health through our probiotic strain LcS, our journey in India has been interesting so far. We see further growth potential in the market for our products. Our signature brand Yakult is already a household name and is being consumed by most families as a part of their daily diet. Today we are present in over 40 cities in 12 statesacross India. The health benefits of Yakult are tangible and there is an upward trend in consumption. To address the growing demand and in line with the needs of the Indian consumer we are delighted to make our product range more versatile and inclusive by launching Yakult Light to accompany our existing probiotic signature product, Yakult. Yakult Light caters to a broad consumer base such as the health conscious adults and the elderly. We will sell Yakult Light across 12 states in both retail outlets and our unique Home Delivery system. We have over 260 Yakult Ladies delivering our health message to Indians on their doorsteps. We have planned a 360 degree campaign to communicate the key messages of Yakult Light as well as consumer engagement initiatives at the ground-level to raise awareness. Dr. Neerja Hajela, General Manager – Science and Regulatory Affairs, Yakult Danone India Pvt. Ltd. stated that India is on the cusp of a change with the health barometer suggesting that 7 of every 10 Indians may be at risk of a lifestyle disorder. While this has been linked to poor nutrition, stress and lack of physical activity, an important determining factor is poor intestinal condition. She highlighted that besides its role in the digestion of food; the intestine also contains about 70% of the immune cells of the human body and is in fact the largest immune organ. It therefore plays a crucial role in deciding your risk of disease and infection. Recent studies have revealed that the intestine is home to 100 trillion microbes which weigh about 2 kg and function as a virtual organ. They are absolutely essential for the digestion of food, the absorption of nutrients, the maintenance of a well-developed immune system and production of essential vitamins such as Vitamin B. Maintaining intestinal balance is therefore very important. Probiotics, backed by decades of research have been scientifically proven to contribute to the balance of these microbes and thereby both support digestive health and contribute to overall immunity. "Yakult Light with reduced sugar contains the same number of the probiotic LcS as the original Yakult and therefore imparts the same benefit of improved digestion and better immunity. The added benefit of Vitamin D in Yakult Light helps in absorption of Calcium thereby improving and maintaining bone health, Vitamin E is an antioxidant which helps to protect the body from the harmful effects of free radicals and therefore slows the process of aging. Yakult Light therefore aims to provide a broad spectrum of health benefits to all age groups. We hope it will offer increased choice to consumers and so motivate them to make it a part of their daily diet ”Dr. Hajela added. Hailing Yakult Light as a welcome addition to her healthy food choices, Bollywood celebrity and fitness icon Shilpa Shetty Kundra remarked, “It is an undisputed fact that a healthy intestine is an indicator of good health but is often ignored by all. Today in our hectic lives, we often end up making wrong food choices which disturbs our gut health. I strongly trust and recommend Yakult because it helps improve digestion and helps build immunity. Probiotic benefits are strain specific and it is important that every probiotic is backed by its own scientific studies. Lactobacillus casei strain Shirota, the probiotic bacteria found only in Yakult is backed by more than 80 years of scientific heritage with more than 100 human studies to validate its safety and health benefits.